Fr Soji Olikkal was born on 19th September in Pandalur, Kerala, India. His home parish is St Thomas Church in Kanjirapuzha Palakkad, Kerala. After his schooling he went to Seminary. Whilst at the Seminary, he graduated in Philosophy and Theology from Paurastya Vidya pidam Kottayam, and in arts from MG University. Father Soji was ordained a priest on 29th December 2001. In his first years as a priest, he became Assistant Director of Sehion Retreat Centre in Thavalam, where he coordinated Inner Healing retreats, couples retreats as well as retreats for priests, nuns and seminarians. He also gave talk shows called Maranatha on Divine Television and another on Jeevan TV by the inspiration of The Holy Spirit. Later he became the parish priest at Infant Jesus Church in Edayapalam and Zonal Director of Nurses Fraternity in Coimbatore. Whilst in India he was also the Diocesan Director of the Catholic Charismatic movement. 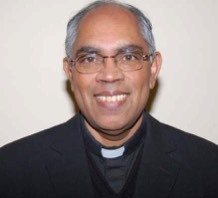 After 9 years in India, Father Soji came to the UK in 2009 as the Assistant Chaplin of the Syro Malabar Catholics. Working with Fr Sebastian Arikat, he conducted many renewal retreats among the Kerala Community in the UK and in 2010 December he became Priest in charge at Blessed Robert Grissold Church. 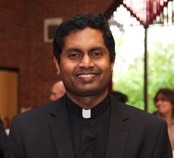 Father Sebastian Arikat was our Priest in charge from 2004 to 2010. Fr. Sebastian Arikat was born on 5th November 1945 in Aloor, India. He was ordained a priest on 5th January 1972. Sebastian is not his original name. He was first called ‘Devassykutty’, which in the Indian language means ‘little servant of God’. His brother suggested he change it to Sebastian when he entered the seminary. During his formation years, he graduated in English literature in Calicut University. After some years of pastoral experience he was sent to Gregorian University in Rome for post graduate studies in Theology and Spirituality. During his time as a priest, Father Sebastian has been a Parish priest, the Rector of the diocesan minor seminary, the Spiritual director in St.Thomas Major Seminary and Pastor of Jesus Youth. After 30 years of pastoral experience in India, he moved to Canada to be the parish priest in St.Mary’s Church, Morrisburg. After 3 years of pastoral work there, he moved to the UK to take up several roles including priest in charge of our church, Chaplain of St. Peter's Catholic School in Solihull and Chaplain of Syro-malabar Catholics in the Archdiocese of Birmingham. Christopher Thornton was born on September 19, 1919 in Dudley and attended the church of Our Lady and St Thomas of Canterbury where he became an enthusiastic altar boy. His sister remembers him kneeling in front of the tabernacle in prayer after Mass. This devotion to the Blessed Sacrament developed into a vocation to the priesthood, encouraged by his mother. In due course, he went to Cotton College as a Church student. There he fourished and was in the First 15 rugby team, although it is said that he did not agree with compulsory sport, which was the situation at Cotton College. Tis gives some idea of his acceptance of authority, which was exemplified in his life as a seminarian and priest. He continued his studies as Oscott college where, again, he showed himself to be a good student. After ordination in 1945, he served as a curate in Balsall Heath, Kingstanding, Leek and Tamworth. In 1958, he was appointed parish priest at Lillington. In those days this meant a field and an instruction to build a school and a church. He rented a house opposite the plot of land that he had bought, and Mass was first celebrated in the Presbytery, then in an ex-army hut and, for a time, in a community centre. The first priority was to build a school and this opened in 1961. Eventually, the new, and striking church of Our Lady and St Teresa was built. This was 963, the year of the opening of Vatican II, but the liturgical thinking that influenced the Council had been around for much longer, and the church was one of the first to be built according to the new thinking, with a central altar. It was only afterwards that a Presbytery was built, where he lived for only 8 months before being moved to St Mary’s, Coventry. There he built a hall with a cloister, linking to the Church. It was even his intention to open a restaurant, an idea that never materialised. In 1983, he moved to a quieter parish in Habberley, near Kidderminster. There the Church was too big and his building skills were challenged in a different way. He had the one building converted into a dual purpose building with a dividing screen between the Church part and the social area. In 1988, after a health scare, he retired to Aston Hall. But his retirement was to be short, as after two years, the Archbishop asked him to take over the parish of Southam. Once again, he set about a building programme in the form of a parish hall. It was in 1997 that he finally retired to a house near the new church in Balsall Common. Here he lived happily until his death on March 11 2005. Fr Thorton was not just a builder of material buildings. He was a very pastoral priest and a builder of God’s Kingdom. His dedication to the priesthood was very clear to all whom he met. In a special way this showed itself in his enthusiasm for the annual meetings of his year group. He actually kept minutes of these meetings over the years. The curious, however, will be disappointed, as he gave instructions for these to be buried with him. As he himself pointed out at their Golden Jubilee, this close-knit year group even managed to die in alphabetical order and on this point he was, as ever, punctilious! May he enjoy the company of the Saints in heaven. 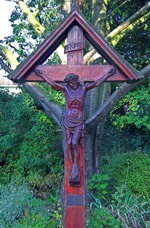 By Canon Edward Stewart, taken from Archdiocese of Birmingham Directory 2006. Monsignor Daniel McHugh became Parish Priest of St George and St Teresa in Dorridge and Blessed Robert Grissold in Balsall Common in 2001 after the retirement of Father Maguire due to ill health. Having studied in Rome he came to Birmingham as was priest in Acocks Green from 1968 to 1974. From 1974 to 1980 he worked in the Caribbean Mission in the Midlands and founded the Caribbean Chaplaincy. From 1980 until 2000, he was first Director of Maryvale Institute, which developed from a centre for catechetics into a centre for pastoral for pastoral and theological courses serving the diocese and the Church at national and international level. Following a year’s sabbatical in Rome, he came to Dorridge. One of his priorities has been in the area of catechesis, and a RCIA course has been introduced into the Parish. There is also a new programme of catechesis of parents for baptism, first communion and confirmation. Monsignor McHugh continues in his role as parish priest of St George and St Teresa after Blessed Robert Grissold parish was moved into a different deanery in 2005. Fr. Tony Maguire was born in 1927, the younger brother by about ten years of Fr. John, commonly known as Fr. Jack, who died in 1991. All his life Fr. Tony revered his elder brother, and it was not surprising that he followed him into the White Fathers' Junior Seminary in Bishop's Waltham. This was towards the end of the Second World War, while Fr Jack was interned in Paris with the British philosophers from Kerlois, of whom Fr Tom O'Donnell is probably now the only survivor. Fr. Tony went through the usual programme of philosophy, novitiate and scholasticate, and, was ordained with thirty-five other students from Monteviot in Galashiels by Archbishop, later Cardlinal, Gordon Gray on 31st. May, 1952. Fr. Tony had an exceptionally lively and attractive personality, and his appointment to work for the promotion of the White Fathers in Britain had something inevitable about it. He stayed in this work for eleven years, eventually taking over from Fr. Gerry Rathe as Superior in 1954/60. He was based in Sutton Coldfield, but his work took him all over the country. Such a charming man could not fail to be a great success in this work, and children especially loved his good humour and sense of fun. He was also a gifted mimic and actor. At the same time, he was an efficient worker and a good organizer. Eleven years was an unusually long period to spend in this work and, in 1963, Fr. Tony was finally released. After making the Long Retreat in Rome under the guidance of Fr. Delfijk, he was appointed to the diocese of Mbarara, in Uganda, then under the direction of Bishop Ogez. Fr. Tony was more fortunate than most English-speaking White Fathers in that he managed to avoid being trapped in schools and seminaries and spent the whole of his six years in Uganda in parish work, principally Makiro, Butare and Kagamba. He settled down very well in Africa, became fluent in the language, Runyankole, was greatly loved by the people, and seemed destined for a long and happy pastoral missionary ministry. In 1969 however Fr. Bernard Duffy, the newly-appointed Provincial of Great Britain, asked him to help him as provincial Treasurer, and so Fr Tony's missionary life came to a sudden and premature end. He worked very hard as Provincial for eight years, among other things organizing the transfer of the Provincial House in London from Holland Villas Road to Stormont Road, and he seemed fairly happy in this very demanding post. In 1977, it was time for a change. These were the Amin years in Uganda, and Fr. Tony apparently did not feel able to return there after such a long absence. During his years in Sutton Coldfield he had become friendly with a number of priests in the Archdiocese of Birmingham, and it was this experience that led him to think of settling down there. So it came about that he left the White Fathers, to the great regret, it must be said, of all his confreres, and shortly afterwards became incardinated in the Archdiocese of Birmingham where he spent the rest of his life, principally as the much-loved parish priest of Tipton, Sollihull and Knowle. He became parish priest of St. George & St. Teresa’s Roman Catholic Church in Dorridge in 1988 and it was during his time there that he oversaw the building of Blessed Robert Grissold Catholic Church in Balsall Common. One memory of his time in Dorridge includes the introduction of the Harvester’s pre-school group in the Church Hall, which was suitably decorated with children’s artwork. Fr Maguire also introduced the Children’s Liturgy which plays an important part in the Sunday Mass for the children. Fr. Tony Maguire's priestly life was therefore almost equally divided between the White Fathers and the Archdiocese of Birmingham. In later years he came occasionally to the funerals of his former confreres, but inevitably there was a certain distance and the White Fathers largely lost contact with him. We only heard of his illness a week before his death. The funeral was celebrated in Avon Bassett, near Leamington, on 22nd. July, 2003. Archbishop Vincent Nicholls presided, with a good number of diocesan priests and White Fathers. Members of Fr. Tony's family were also there, including two of his brother Tom's daughters, Mary and Paddy. We missed you sadly, Fr. Tony, after you left us, but we look forward to a happy reunion in due course in the house of the Lord whom you served so faithfully. Father Manion was ordained on the Feast of Saints Peter & Paul in 1943. He then undertook further studies at Cambridge before joining the teaching staff of Cotton College in 1946.He became Parish Priest successively at Cobridge and Besford. In 1975 he was appointed Parish Priest for St George & St Teresa Dorridge and our Church dedicated to St Philomena in Balsall Common. He was not a stranger to the parish. During his years at Cotton he regularly travelled to say mass in either Dorridge or Balsall Common; indeed in 1948 he was the first priest to celebrate Christmas Night Mass in St Philomena’s. This was the period when his uncle, Monsignor Canon Bernard Manion (a former Head Master of Cotton College), was our Parish Priest. We have no information about Canon Patrick Smith. If you do and would be willing to share it, please get in contact using the Contact Us link to the left. We have no information about Father Lawrence Smith. If you do and would be willing to share it, please get in contact using the Contact Us link to the left. We have no information about Canon Bernard Manion. If you do and would be willing to share it, please get in contact using the Contact Us link to the left.